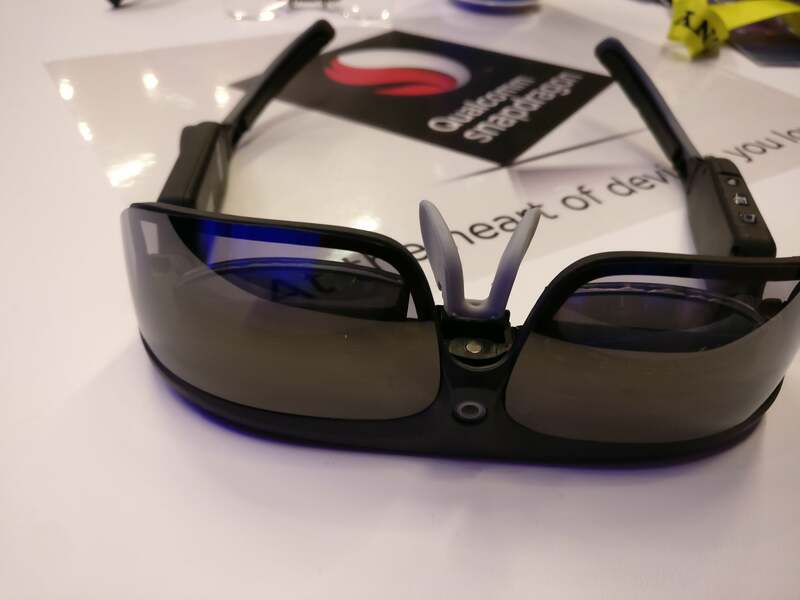 ODG's glasses are surprisingly comfortable, though we never got to actually test AR or VR. Microsoft’s HoloLens led me to believe that augmented-reality vision hardware needs to be big and bulky. But ODG’s new Android-powered R-8 smartglasses just made me think again. Osterhout Design Group’s R-8 glasses will cost less than $1,000, and combine both augmented reality (AR) and virtual reality (VR), offering 720p resolution independently to either eye for true stereoscopic vision. There’s also an R-9 version that will offer 1080p resolution for $1,799. 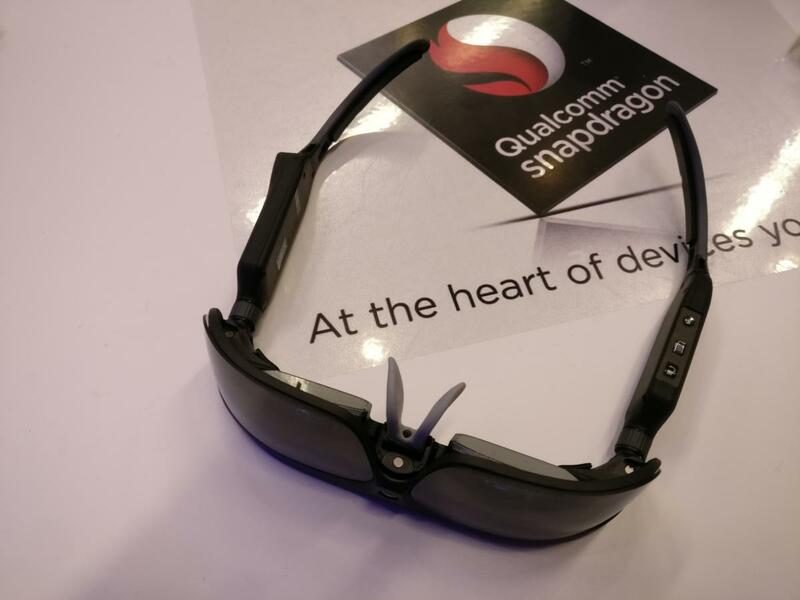 The two glasses are the first design wins for the new Qualcomm Snapdragon 835 chip, which Qualcomm revealed Tuesday at CES 2017. 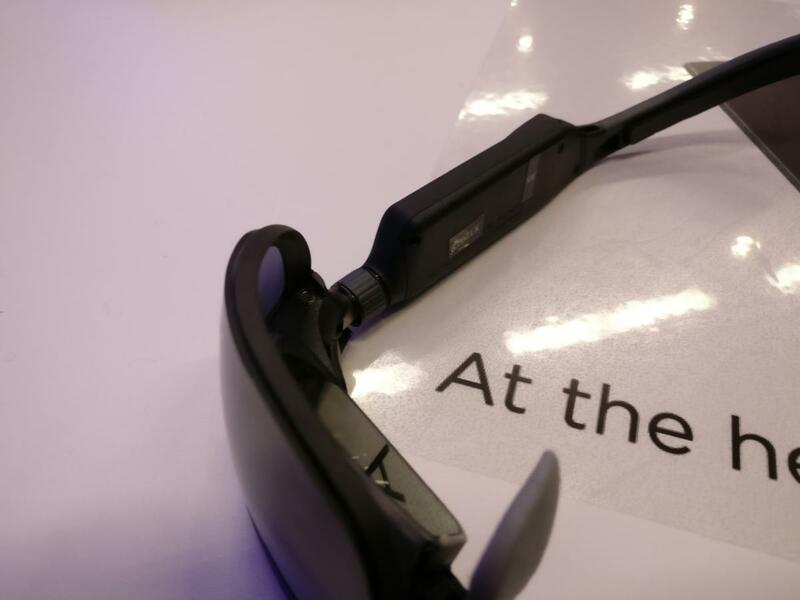 Android-styled control buttons are built into the arm of the ODG glasses. PC companies are banking on a virtual reality future in which headsets like Oculus Rift and HTC Vive are tethered to a powerful desktop GPU. But Qualcomm hopes that its Snapdragon 835 System-on-Chip—which will inevitably power a plethora of smartphones—will also find homes in automotive and smartglasses. Right now, the flagship AR platform is the Microsoft HoloLens, a 20-ounce headset that dominates one’s head—you never forget you’re wearing heavy hardware. The R-8, by contrast, weighs just 4.5 ounces. It’s not as light as a pair of actual glasses, but it’s still far lighter and more comfortable than HoloLens and various VR headsets. Two knobs, one on either arm, control volume and on-screen menus. Now for some major caveats: I didn’t get to see either AR or VR content during my demo. Nor has the company disclosed the size or longevity of the battery. ODG’s message is that AR/VR glasses don’t need to be bulky, and what I saw Tuesday confirms that—but we still don’t know if the AR and VR experiences are any good. Both the R-8 and R-9 run Android Nougat, which is powerfully reflected in the button configuration on the underside of the glasses: You’ll find Menu, Back, and Power. The Back button is actually a rocker switch—rock the switch one way to go back, and the other to trigger your choice. There are also dials to select options and control volume. ODG is promising to show off an augmented-reality display demo, based on the Alien movies, later this week. But on Tuesday, the sum total of “testing” the ODG glasses involved watching movie trailers projected inside the lenses. The R-8 uses a virtual display with a greater than 40-degree field of view, while the R-9 extends that to 50 degrees. Even in a fairly well-lit conference room, the glasses projected the movies clearly and brightly, and it appeared that all (or almost all) of the videos’ details were preserved. I think I’d be willing to watch a movie on an airplane using the ODG glasses, if that’s any measure of the experience. 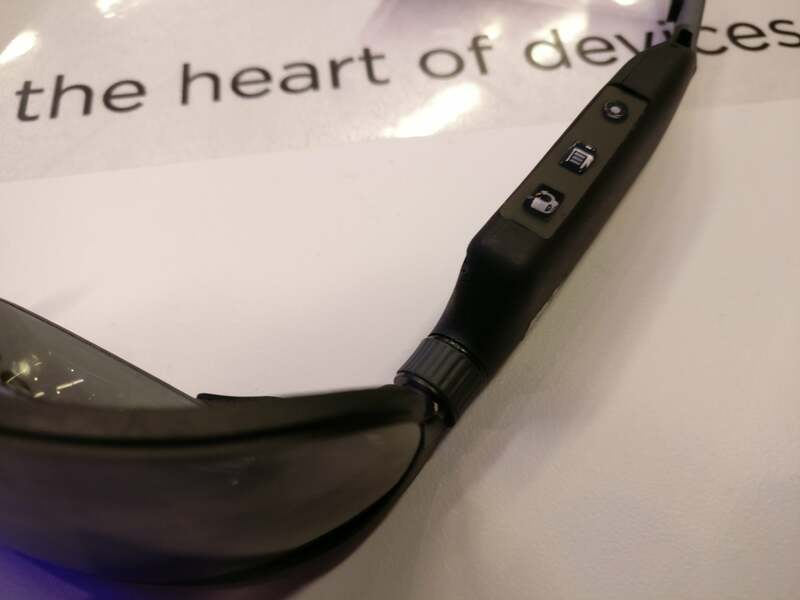 The front of ODG’s smart glasses. Both models have front-facing cameras, with resolutions as high as 13 megapixels, according to a report by VentureBeat. Such high resolutions are necessary for augmented reality, where virtual objects are overlaid onto the real world. Is it likely that consumers will shell out more than $1,000 for an AR/VR solution? Maybe not, especially with established VR products like the HTC Vive already falling below $800. Still, as AR/VR products become more like normal eyewear, it’s likely that an increasing number of people will be encouraged to try them out, as well as possibly adopt them for everyday use.